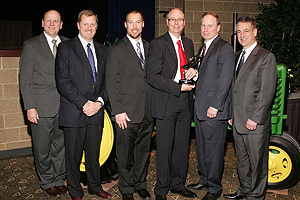 Haldex Concentric has won the 2009 Supplier Innovation Award from Deere & Company for its Alfdex separator technology, which removes 99% of oil and soot particles from engine vent gases. The award was accepted on behalf of Haldex Concentric by Mats Ekeroth, Managing Director of Alfdex AB, at a dinner in the Quad Cities Convention Center in Bettendorf, Iowa. This is the inaugural year for this award promoting supplier innovation and the presentations were made by Dave Meyer, Director Supply Management and Klaus Hoehn, VP, Advanced Technology and Engineering. Suppliers were encouraged to share their stories of innovation through self-nomination. All submittals were evaluated on the dimensions of creativity, feasibility, collaboration and bottom-line impact. The Alfdex oil mist separator uses centrifugal separation techniques to prevent unclean ventilated crankcase gasses returning to the inlet of diesel engines. Oil droplets and soot are removed from the blow-by gas and returned to the oil sump, so that only clean gasses are returned to the inlet manifold. Mats Ekeroth commented: "Alfdex is firmly established as the world's leading supplier of highly efficient solutions for cleaning of crankcase gas on trucks and buses. Several of the world's leading truck and engine brands have selected the Alfdex system, including Volvo, Renault, Mack, Mercedes-Benz, Freightliner, Western Star, Sterling Trucks and Navistar. We consider this an important award, because it demonstrates that there is interest in our product from what, to us, is a completely new segment - the agricultural industry." The Alfdex design combines Alfa Laval's market-leading expertise in industrial centrifugal separators with Haldex's know-how as an established supplier to the global automotive industry. Designed for diesel engines in the capacity range of 5 - 16 litres, Alfdex can be used interchangeably in open and closed crankcase systems and requires no maintenance or filter changes during the engine's lifetime. Alfdex AB is a joint venture between Haldex AB and Alfa Laval. Alfdex is headquartered in Landskrona Sweden and, via Haldex Concentric, has global sales and manufacturing facilities in six countries. Haldex Concentric is a division of Haldex AB and a major supplier of engine water pumps, fuel pumps, lubrication pumps and crank case ventilation systems to John Deere's operation in Waterloo, Iowa.